Permanent Coffee Filter Vs Paper – Block The Oils Or Save A Tree? 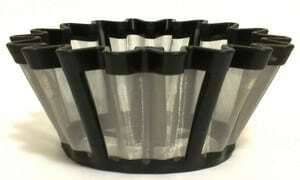 The question if you should use a Permanent Coffee Filter or Paper Filter can only be answered by yourself. There is actually no right or wrong but only preferences. What I can do for you is to help you making the perfect decision. So if you keep reading I will give you an understanding of the differences and the pros and cons of the two filters. With the additional information what flavor of coffee you can expect you may then be able to choose the right coffee filter for your best experience. Both filters won’t affect the experience of your coffee so much that I can say you must use exactly this filter. But environmental reasons or just convenience may affect your buying decision. Let’s have a look at the pros and cons of both filter types. The advantages of paper filters are obvious. They are disposable and cleaning is not necessary. They are biodegradable so you can throw them in your compost if you have one. However, coffee filters are made from trees. If you consider yourself environmentally conscious this could be a reason to choose permanent filters. Regarding taste the coffee could taste a little less rich with paper filters because it won’t allow the coffee oils through the filter. Since taste is subjective you could see this as an advantage. Some others prefer stronger, full-bodied flavors and thus probably tend to permanent filters. Another thing I like is that you don’t have to be afraid of any leftover coffee in the filter. Coffee oils can become rancid and lead to a stale coffee flavor. Comparing the ongoing costs of reusable filters with paper filters, you can save some money when choosing the reusable one. Let’s say you brew an average of 5 batches a week. That means you need 260 filters a year. When a pack of 100 filters is about $7 you are spending close to $20 for filters per year. 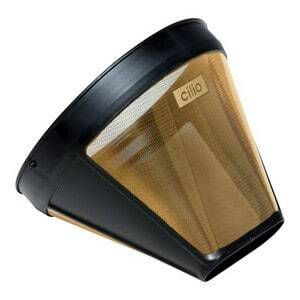 Reusable coffee filters cost around $5 – $10 (except the gold plated ones – see below). For the $10 that you save you can treat yourself with some high-quality coffee beans. While they can be used over and over again and no trees are hurt you have to clean them after every use. Now that we understand the advantages and disadvantages let us put them together quickly to get a better overview. The cheaper permanent filters are usually made of synthetic nylon or other cheaper metals with a gold tone. It is said that they leave some aftertaste in the coffee. The best premium coffee makers usually come with a high-quality gold filter but even if yours did not you should consider all the advantages. The 24-karat gold plated foil over stainless steel won’t alter the taste or absorb any flavor. The foil also helps to hold back undesirable sediments but does not allow leftover coffee to hide like in the nylon or mesh filters. It is dishwasher safe and BPA free and if treated properly the Gold Coffee Filter will last for years and years to come. There are two big disadvantage of K-Cup Coffee Makers! The first con is, they are very expensive. And secondly, they are non-recyclable. With a reusable K-Cup filter you can kill two birds with one stone. And on top of it, you can use freshly ground coffee for better tasting coffee! Keurig 2.0 filters may not fit in older machines so make sure your machine is compatible. There are also K-Cups that use a durable gold tone filter like the SwiftBrew 24k Gold Tone Coffee Filter (click the image to get more detailed information). Did I miss anything? Which is your favorite? 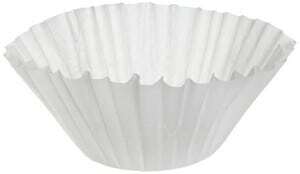 Paper coffee filter? Or gold filter? Sooo, which do you use, permanent or paper? In my drip coffee maker, I use the permanent gold tone filter when I brew really good, freshly roasted coffee. I like the full-bodied flavor and the coffee oils in my coffee. But it’s different with coffee from the shelf – here I take a paper filter. Sometimes when the coffee has been roasted several weeks ago, maybe even months, the oils (among others) make the coffee taste rancid. And with a paper filter, I can at least block these oils and reduce the unpleasant taste.